9 May 2012: I’d just returned from my morning run and was about to jump in the shower and prepare to go to the Victory Day parade when my phone rang. And thus began the day. Viktor Mykolaiovych was only 44 years old (born in 1967). The teachers said he had had high blood pressure; I don’t know if he’d been taking any medicine for it or not. I gleaned later that he had a thrombosis (from his right arm to his heart? I’m not sure about how it all works, medically), maybe a myocardial infarction. We are all in shock. I saw him at school on Monday and asked him to take a look at the printer in my classroom that hadn’t been working. We met last week to go over some details on my grant and he mentioned that the work in the multimedia English classroom wasn’t finished; he promised that we’d replace the desks and chairs and try to get darker blinds so stuff on the projector screen would be easier to see. Now it’s unclear if any of these things will happen. Viktor Mykolaiovych became our school Director just last fall, after having been vice principal for a while; he also taught Information Technology. Since he became the director, Sniatyn School No. 1 has flourished. He was energetic, enthusiastic, and really pushed forward in terms of adopting new technologies, renovating existing spaces, and elevating the school’s status in myriad ways. He was efficient and to-the-point in all manners of business. He had kind, intelligent eyes. He was the one who initiated and wanted me to write a grant for the school’s English classroom; he was excited to work with me (and the Peace Corps) and use my skills in any way possible. I was grateful for his enthusiasm; he really wanted me to extend my service here and told me multiple times that the pupils really like me. He also corrected my Ukrainian grammar while bragging to others that I could understand everything in Ukrainian. Viktor Mykolaiovych’s wife, Nadia Mykhailivna, is also a teacher at our school, and a wonderful woman. Their younger son, Vitaliy, is one of my talented 10th-formers, and already sounds a lot like his dad when he speaks. I taught a lesson to the 10th form just yesterday. This is a huge loss: for his family, for the school, and for the entire Sniatyn community (educational and otherwise). We, the teachers, went to his house this afternoon to view the body and offer support. (It’s tradition here to have a 2- or 3-day open-casket wake.) The body was a grayish-yellow color, the mouth set into a slightly stern line, like it had been in life. 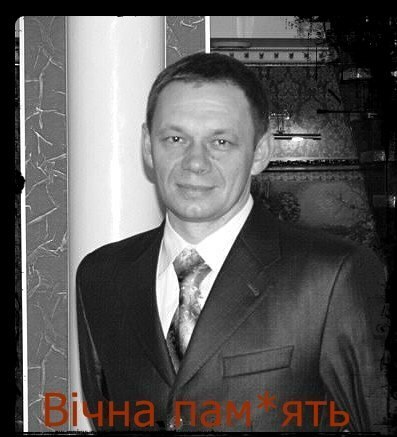 11 May 2012: The Funeral (my second in Ukraine; the first one was when the Director of our Methodological Cabinet died last fall): Viktor Mykolaiovych’s funeral was today. I didn’t go to the actual service but rather went to school, where most of the teachers and 4th-8th form pupils were waiting. When it was time, the pupils — and tons of other people — lined the main street from in front of the school all the way up past the grocery store almost to the park. Halya and I stood directly opposite the school. The procession appeared. In front, the 9th-11th form pupils, some teachers, and parents, led by my 10th-former, Nazar, carrying a framed photo of Viktor Mykolaiovych. All were carrying those fake-flower shield-like things. Next came the orchestra and choir, followed by the flat-bed truck carrying the open casket — his wife, sons, mother, and other family members were just behind the truck. It stopped right in front of us and paused as the school bell rang — this is a tradition when a teacher dies, Halya told me — and three of Nadia Mykhailivna’s 9th-form pupils, carrying a photo of him and a Ukrainian flag adorned with black ribbon, came down to the roadside. The procession carried on and we joined in for the last few hundred meters to the cemetery. I was pretty close during the burial and could see Viktor Mykolaiovych lying there, almost as if he was asleep. Across from me were my 10th-form pupils — VM’s younger son, Vitaliy, is their classmate, and he is lucky to have such supportive classmates and friends during such a difficult time. So many people were there: teachers, pupils, parents, administrators, educators, family, friends. The grief was overwhelming. Viktor Mykolaiovych touched so many lives in Sniatyn, and we will miss him terribly. This entry was posted in community, education, health, language, Peace Corps and tagged news on 11.05.2012 by taplatt.